Established in Dec. 2011 the business has grown 80% on average year on year from startup. The company is certified and accredited for ISO9001 for Quality Management System and ISO27001 Information Security Management and ICO registered. The business was offered investment on RTE Dragon’s Den and with HALO in Northern Ireland. The company now has over 150 customers in Ireland, UK, France and USA. Hybrid Mail Solutions are committed to providing a secure and efficient mailing service that produces a high quality, added value, user friendly solution. Our aim is to enrich our customers experience creating a solution which is customer driven. We have a clean business purpose to help individuals, businesses and organisations achieve greater savings on print and postage. We aim to provide a service for any business no matter how big or small, aiding them to communicate cost effectively and efficiently with their customers. 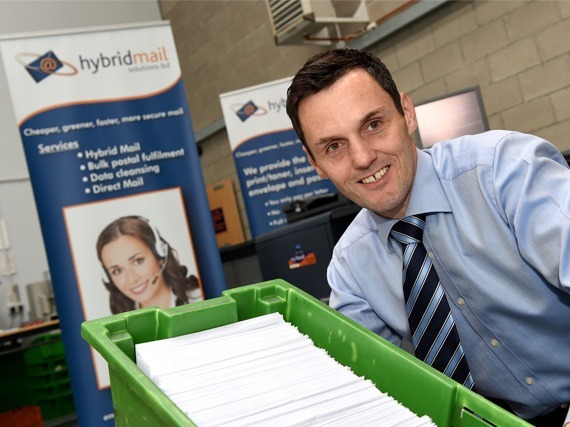 Hybrid Mail Solutions are ISO9001 and ISO27001 certified and accredited. The ISO9001 Quality Management System and ISO27001 Information Security Management Systems apply to: The provision of mailing, printing and associated services.